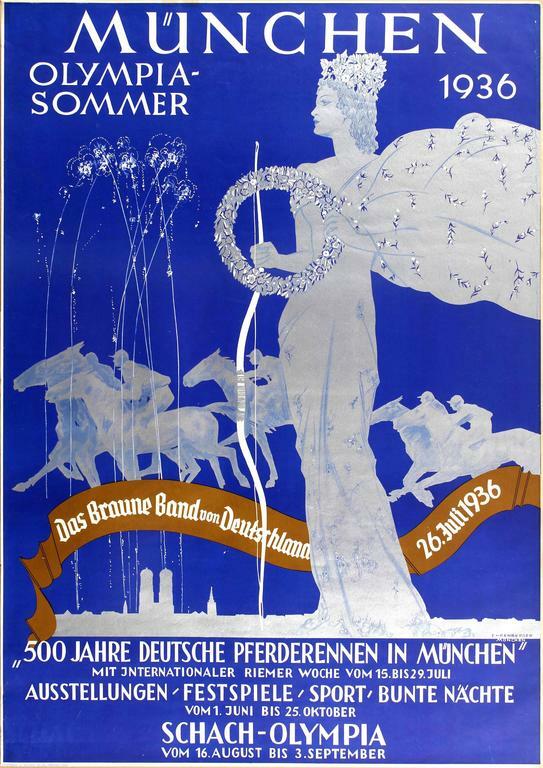 Original vintage Munich Olympic Summer sports poster for the annual Brown Ribbon of Germany / Das Braune Band von Deutschland 26 July 1936 - 500 Years of German Horse Racing in Munich at the international horse race week at the Riem racecourse 15 to 29 July with Exhibitions Festivals Sport and Colourful Nights 1 June to 25 October and the Chess Olympics / Schach Olympia 26 August to 3 September. Great Art Deco design by Ludwig Lutz Ehrenberger (1878-1950) issued by the Third Reich to promote a summer of horse racing, sporting and cultural events in celebration of the 1936 Olympic Games (the Games of the XI Olympiad) in Berlin featuring a great image of a goddess in a floating dress holding a bow and a flower garland wreath with horses racing behind her and a fireworks illuminating the night above the city skyline, the text above and below in stylised white letters against the blue background and across the image on a ribbon. 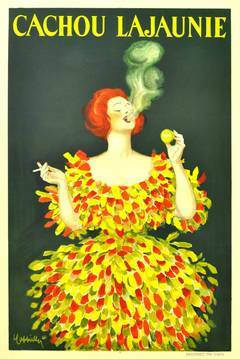 Printed by Joh Roth, Sel. W., Munich. Very good condition, light staining on margins. Very good condition, light staining on margins.